Heat oven to 400°F. In 12-inch skillet, cook beef, onion and garlic over medium-high heat, stirring frequently, until beef is brown; drain. 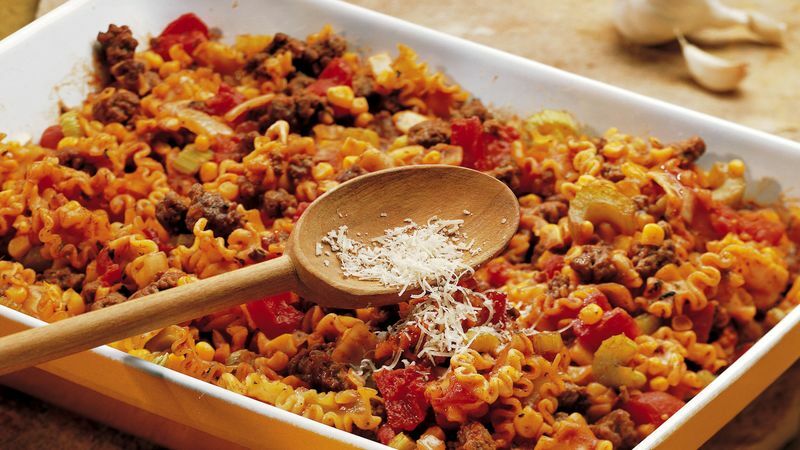 Stir in uncooked Pasta, Sauce Mix and remaining ingredients except cheese. Pour into ungreased 3-quart casserole. Cover; bake 45 minutes. Serve with cheese. Make it Italian night at your house! Pull out the checkered tablecloth and add a candle in a wine bottle along with appropriate music to make tonight’s dinner extra special. No more Italian seasoning? Just use dried oregano or basil--or a combination of the two--instead.